I returned to the art I loved as a child and young adult after a twenty-year career in the law. When I retired from being an Assistant attorney General for Arizona in 1995, I resumed painting in the Tempe studio attached to my home. I have had five years of class work with Donna Levine, a Tempe artist and teacher. My husband, Larry, and my two grown children are supporters of my second career. 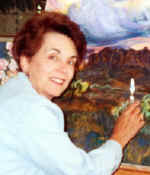 Gail L. Boyd holds the copyright to all images placed in this website. These images are for viewing only and should not be used for any other purpose without the express permission of the artist.